Knowledge@Wharton’s technology and media editor, Kendall Whitehouse, often explores the business side of popular culture. He just returned from San Diego Comic-Con, the largest U.S. convention celebrating the popular arts, to investigate what’s new in entertainment marketing. Here is his report on this year’s trends. For more of his dispatches from Comic-Con, see “Reports from Comic-Con” in Whitehouse’s blog, On Technology and Media. TNT’s marketing campaign extends to San Diego International Airport. In an attempt to stand out among this clatter, film studios and television networks pull out all the stops to launch elaborate marketing events to attract the attention of the 130,000 Comic-Con attendees who descend on San Diego’s Gaslamp Quarter during the pop culture festival. In addition to star-studded panel sessions, Hollywood sizzle reels and elaborate vendor exhibits, downtown San Diego is blanketed with advertising. There appear to be few surfaces in the Gaslamp Quarter that aren’t turned into billboards during Comic-Con. Buildings, buses, trains and trolleys are wrapped in banner ads for television programs, movies and video games. With all of downtown San Diego enveloped in ads, this year Time Warner’s Turner Network Television (TNT) extended their campaign for the upcoming television program Legends to San Diego International Airport. “TNT’s Comic-Con invasion will begin with the Legends takeover of San Diego International Airport, marking the first time a brand has ever taken over the airport,” reads the television network’s press release. “Travelers flying into San Diego … will be greeted with Legends imagery and messaging throughout the airport.” And, indeed, ads for the upcoming TV show appear on everything from the building’s columns and escalators to the baggage carousel. This year, several high-profile marketing efforts went virtual, using state-of-the-art virtual reality hardware to place viewers in the middle of the action. 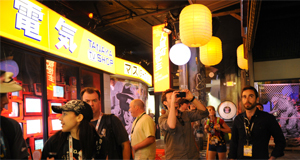 Legendary Pictures recreates Tokyo at Comic-Con 2013. Last year, the pinnacle of this ever-escalating war for attention consisted of large, physical environments that let visitors enter fictional worlds. To advertise the forthcoming release of Godzilla, Legendary Pictures constructed a life-sized Tokyo street scene inside a building in downtown San Diego. When a simulated attack from the monster was imminent, participants were rushed into an elevator to escape to a higher floor. The escape plan then seemed to go awry and the roaring creature appeared outside the window (courtesy of a life-sized image on a high resolution LCD display). This year, several high-profile marketing efforts went virtual, using state-of-the-art virtual reality hardware to place viewers in the middle of the action, with four major marketing events featuring the Oculus Rift “4D” technology from Oculus VR. With an Oculus VR headset and stereo headphones, the technology places the viewer inside a virtual world. Unlike a 3D movie, where the view is fixed by the position of the camera, with the Oculus technology the participant can move his or her head around to view the world from any angle. The difference between watching the 3D movie and interacting with the Oculus Rift is akin to the difference between looking through a window at the world and actually being in the world. In some cases, motion and vibrations add additional realism to the experience. 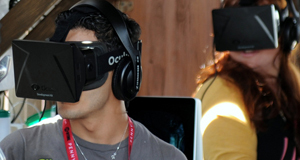 Oculus VR was recently acquired by Facebook for $2 billion. In a Facebook post at the time the acquisition was announced, Facebook chairman and CEO Mark Zuckerberg hinted at some of the company’s ambitions for the technology: “Immersive gaming will be the first…. But this is just the start. After games, we’re going to make Oculus a platform for many other experiences.” Last weekend’s San Diego Comic-Con may point to the future of this technology for advertising. The Oculus Rift puts participants inside a virtual world. While Legendary Pictures made a big splash at Comic-Con last year with the company’s walk-through environment, the Godzilla Encounter, this year Legendary used the Oculus Rift to digitally create another immersive experience. Pacific Rim: Jaeger Pilot places the viewer inside a 250-foot robot (called a Jaeger) to fight a giant monster known as a kaiju. The 360-degree simulation was created from digital assets created by Industrial Light & Magic for the Pacific Rim movie. A few rows over in the exhibition hall, 20th Century Fox Home Entertainment used the Oculus Rift to promote the upcoming release of X-Men: Days of Future Past on Blu-ray and DVD. Participants sit in a chair modeled after the wheelchair of the film’s Professor Charles Xavier and, once they don the Oculus Rift headset, enter the Cerebro, the room-sized device the Professor uses to detect the presence of advanced humans. There, the viewer searches the virtual world to locate the movie’s shape-shifting character Mystique during the 90 second adventure. Outside the Convention Center in the nearby Petco Park Interactive Zone — a parking lot-sized fairground of entertainment industry marketing activities — the Fox Television division of 21st Century Fox presented the Sleepy Hollow Experience. Here, the Oculus Rift transports viewers to a graveyard in Sleepy Hollow where Ichabod Crane warns of the approaching headless horseman. Once the horseman arrives, he quickly severs the viewer’s head and lifts it up in his hand. It is, I can report from personal experience, an eerie sensation to lose your head inside a realistic virtual environment. Fans then receive a photo of their decapitated head lying on the ground in Sleepy Hollow. If the Oculus Rift or similar technology eventually becomes the nexus home entertainment … we may witness the demise of large-scale constructed marketing installations. Time Warner’s HBO used the Oculus Rift to let Game of Thrones fans travel to the top of The Wall of Westeros, where participants encounter similar terrors. Players enter a physical replica of the Castle Black winch elevator and then put on the Oculus Rift headset. As the elevator virtually rises, the real, mechanical elevator shakes and wind blows to add additional verisimilitude. While the virtual worlds created by the Oculus Rift captured much of the excitement at Comic-Con, some companies allowed fans to have very real experiences. 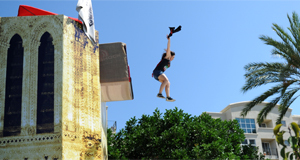 A fan takes a “Leap of Faith” at the end of the Assassin’s Creed obstacle course. To advertise the new Fox television show Gotham, participants flew down a zip line past a large background image of Gotham City. To promote the upcoming Assassin’s Creed Unity video game, software developer Ubisoft offered the Assassin’s Creed Experience, an obstacle course requiring participants to run, swing, duck and jump to avoid the impediments in their path. At the end, participants could take a “Leap of Faith” by jumping from a 25-foot tower into an inflatable bag. Nothing virtual here. These elaborate constructions may become quaintly archaic in the emerging world of virtual reality, however. Rob Salkowitz, author of Comic-Con and the Business of Pop Culture: What the World’s Wildest Trade Show Can Tell Us About the Future of Entertainment, believes the technology is “a complete game changer on the order of the Internet or mobile telephony.” Salkowitz sees the content for these immersive experiences coming largely from the domains of comic books and gaming. If the Oculus Rift or similar technology eventually becomes the nexus home entertainment — replacing current gaming and home theater systems — we may witness the demise of large-scale constructed marketing installations. What was previously location-based marketing will become location independent. There’s no need to travel to San Diego to have a Godzilla Encounter when virtual reality technology can bring the experience into your home. As Zuckerberg observed in his announcement, “Oculus’s mission is to enable you to experience the impossible. Their technology opens up the possibility of completely new kinds of experiences.” This opens the door to new worlds in both entertainment and advertising. It will be revealing to see what is unveiled at next year’s San Diego Comic-Con.